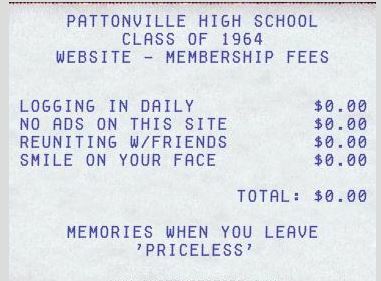 submitted from Pattonville and St. Ann Elementary schools - 1952-1958 - left tab of main menu page. Wayne Smith has went and done it again! This time he has uncovered a treasure trove of photo's taken between 1961 - 63, pix you won't find in the yearbook....... ENJOY!!!!!!!!!!!! Can you name everyone? Wayne Smith directed and submitted a film from a 1962 Latin class project, taught by Mrs. Claire Johnson. Don't miss "Aeneas and the Cruel Cyclops" starring Kurt Wahlbrink as pious hero Aeneas, youthful Darrell Pepper as faithful friend Achates, and the late Dave Viehmann as the savage Cyclops - produced by Gary Wallace. Included is the film's cinema release, and another version release with director's comments. Enjoy & thank Wayne for his hard work putting this together! The Class of 1964 celebrated our 50th Reunion on Saturday, September 6, 2014. The day before was almost 95 degrees and sweltering, Saturday temperature barely made it into the low 70's (welcome to St. Louis weather). Turnout for this event was better than expected, and, everyone had a good time visiting and reconnecting. The surest sign we are getting older: large amounts of food, water, soda, and beer remained at the end of the day! Principal James. C. McMahon recorded a greeting to our class - to view it click "Mr. McMahon's Greeting" tab on the top of this page. Mr. McMahon lives in Wisconsin with his son, Tom. His eye sight is failing, and he is 90 years old. On September 6, 1944, Mr. McMahon was wounded while serving our country in the Army during World War II, seventy years ago. Effforts to consolidate the many 100's of digital photo's taken at the reunion will take some time - especially to "tag" everyone in the photo's, so bear with us a while. Click on the "50th Reunion Photos" tab at the top of this page to see photos contributed by classmates for all to enjoy! If you would like to contribute your photo's to the class collection for all classmates to enjoy, please contact Don Kimmel (314-703-8400) or email don_kimmel@sbcglobal.net. Thanks to everyone that made it such a great day by your attendance and enthusiasm. Understandably, some classmates were unable to attend - for a variety of reasons. Maybe next time (5 years out). How much does it cost to join this website? If you attended the reunion and wish to submit digital photo's to share with classmates - please click on the "Contact Us" tab at the top of this page and provide details on where the photos are stored and we will include them on this website. Please click on tab marked "46th Reunion Photos" on the left of this page to view a slide show of photos submitted by classmates and Tim Stroop taken at the reunion, September 4, 2010. Other options to view and download photos to your computer will also be available on that tab. Q: Do you know why we had such a really good time in high school? A: Attention Deficit Disorder was not invented/defined yet!!! More yearbook photo's will be added as new tabs in the near future so come back & visit often.